Just when you thought it was safe to return to the cafeteria, Reptar crashes the party! 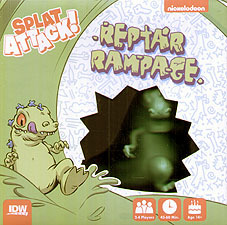 In Reptar Rampage, an expansion to Nickelodeon's Splat Attack!, Reptar joins the food-fight fray as an uncontrollable beast of destruction! Attempt to defeat Reptar by teaming up and splatting him with food, but be careful! Every successful hit causes Reptar to rampage, stomping across the board! If you get stomped on, then Reptar eats your points! The player with the most points by the time Reptar is defeated wins the game! Includes 1 ginormous Reptar Figure! Team up to take down the rampaging Reptar! This game requires Nickelodeon Splat Attack! to play.